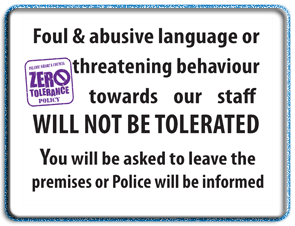 We hold a very strict policy on abusive behaviour towards our staff members. and sometimes end up venting out on ISC staff members. ISC staff members are very tolerant people and will endeavour to listen to your problem with complete patience. But not at any point will we accept Foul and abusive language or physical violence. If at any point someone uses foul language on the phone, the ISC staff will ask you to call back later once you have had a chance to calm down and will gently put the phone down. If you are visiting the ISC in person and become abusive towards the staff, we would ask you to kindly leave the premises and come back once you have composed yourself. If physical violence is involved in any way, we will not hesitate to call the police. If you have a case registered with the ISC and any of the above occurs, we will keep a record of that within your case file. At the same time no client should have to accept abuse from the ISC staff members. If such an incident occurs, you can use the form below in full confidentiality.